As the world reels from shrinking economies, one Detroit man has found an opportunity to build an incredible supercar almost in his backyard. Jeff Lemke, a 41-year-old car nut, spent 12 years building composite body panels that Dodge Viper owners could buy to keep rain and wind out of their admittedly leaky sports cars. It was a good business, but in 2009 Lemke decided to do something a little more ambitious. He decided to build his very own supercar. That car is the Falcon F7, a midengine aluminum monocoque sport coupe powered by a 620-horsepower V8. And in true supercar fashion, it promises a 200-mph top speed and a price of $245,000. So far, Lemke and his team at Falcon Motorsports in rural Holly, Michigan, about an hour outside of Detroit, have built and sold only one production car. But they have an unpainted development car and a chassis mule that runs, too, so the dream is still alive. Lemke started the design in 2009: “I laid out this car in foam. It was during tough economic times, and a lot of companies were willing to do work on the body and other parts of development just to keep the lights on. The styling and surfacing was done by the community of experts in the area. I could never have built this car anywhere else,” he explains. Lemke’s original plan was to build a midengine version of the Corvette, on a hydroformed steel frame, he says. Fate, however, changed Lemke’s mind toward more modern sports car design. It started when a local racecar builder offered to participate in the project by providing an aluminum tub and suspension. His name was Fran Hall and his Superlite SLC sports racer dominated the unlimited class in the NASA regional racing series in 2011. Lemke was surprised when Hall offered him an SLC chassis after seeing Lemke’s original steel-based design, then called the Mach 7, at the Detroit auto show. The new car, called the F7, weighs just 2,800 pounds and rides on the same 105-inch wheelbase as Hall’s racers. Overall length is 174 inches, 3 inches longer than a Lamborghini Gallardo LP550-2, while the Falcon F7 rides 2 inches lower. The F7 is also 3 inches wider than the Gallardo, following the ages-old mantra in the Detroit car-building business of aiming toward “longer, lower and wider” cars. The engine is the 7.0-liter, small-block V8 from the Corvette Z06. Lemke adds a unique carbon-fiber intake manifold, and the engine sits exposed through a hole on the top of the engine lid behind the driver. Power travels through a Ricardo six-speed transaxle to the 20-inch 335/30 rear tires. Front wheels carry slightly smaller 275/35 20-inch tires, while encompassing 15-inch rotors. Rear rotors are 14 inches in diameter; brakes are four-piston Stop Tech calipers. We’ve driven hand-built concept cars and prototypes that well-meaning engineers have built in their home garages, and the hand-built Falcon F7 is well beyond any of these results in terms of construction and performance. The F7 we drove (the first and only production model) feels much more refined than even the original Dodge Viper, the V10 400-hp sport coupe developed on a shoestring by then-Chrysler boss Bob Lutz. In reality, the original Dodge Viper had little aerodynamic finesse, and would lift its nose at speeds where a Porsche 911 Turbo was not even in its power band. 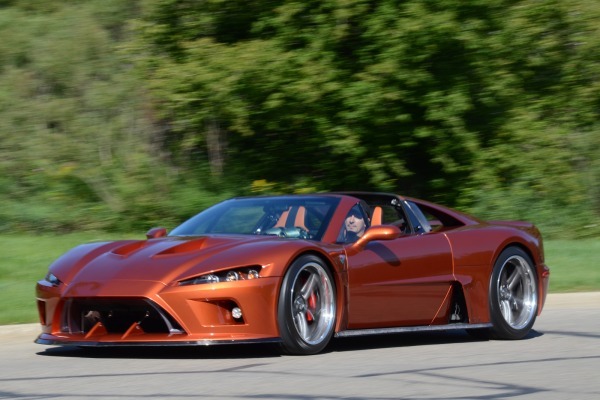 The Falcon F7, despite its aggressive gaping shark mouth design, does not lift. And because of that, 200 mph is attainable, according to Lemke. We didn’t drive it that fast on public roads, but we did pass 100 mph and it felt solid. Launching to 60 mph is said to take just over 3 seconds, and it feels controlled throughout. The tweaked 7.0-liter pushrod V8 power plant generates roughly 620 hp and feels happy to rev, especially since it has less car to move. A Corvette Z06 weighs about 400 pounds more than the 2,800-pound Falcon F7. With the enormous 20-inch Michelin Pilot Sport tires, limits are very high for a street car. It takes a conscious effort to break the rear tires loose, even using full throttle. On this first production car, there is no assist for the brakes, so the pedal requires considerable effort. Braking assist is planned for future F7s. The best part about going fast in the Falcon F7 is the sound of its V8. It’s much louder than its Corvette counterpart, yet the engine sounds so balanced and harmonious that you feel it wants to rev far beyond our 5,000-rpm cruising speed. The electrically assisted rack-and-pinion unit is from the Fran Hall racecar, and is likely too light for track use. We found that it has plenty of road feel; it’s just that the efforts are very low — you can drive this car easily using only a thumb and forefinger of each hand. Like the supple ride, the seats are not racing stiff, either. Still, the passenger seat is squeezed into a narrow channel between the door and an exposed brace for the A-pillar roll hoop, so it doesn’t allow much room to move around. Lemke says the exposed roll hoop is meant to add to the race-bred character of the car. Here’s the tricky part of building a supercar in your backyard: Lots of people have tried it and failed. “I want to get a few more cars on the road so people can see that it’s real,” Lemke reveals. “People say this is just a concept car, but I don’t want to rush it to production if it’s not ready.” To get ready for production, Lemke sold the first car with a lifetime guarantee to a New York enthusiast. As Lemke develops improvements and refinements to the first car, he is adding them to the customer’s car without cost. However, Lemke is not going to sell future Falcon F7s as turnkey automobiles. “We have a manufacturer’s license, and we discussed selling completed cars for a long time, but we will sell it as a component car, with the buyer titling the car [as a home-built machine] and participating in the development.” Ferrari uses a similar, but much larger, program of leasing race-bound production cars to customers and then capturing on-track data for development. Lemke expects to build up to 10 production cars in 2013, and then up to 25 in 2014. There is also an “investor” option that allows a potential buyer to give $250,000 to the Falcon company and participate in the car’s development. After three years, the customer can take delivery of a new, un-driven car plus an interest incentive, or get the $250,000 back with interest and no car.